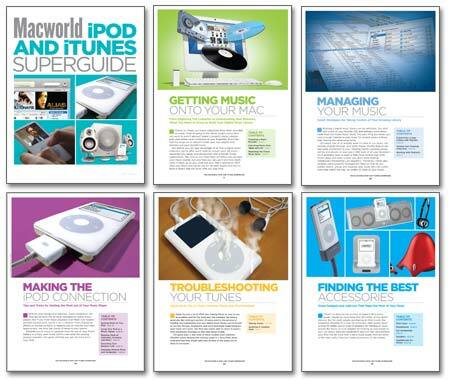 The Macworld iPod and iTunes Superguide is a new 88-page book, direct from the editors of Macworld! Every year Macworld publishes huge amounts of digital-music advice, including hands-on tutorials and little known shortcuts. Now, for the first time, all of that advice is available in one place, updated and expanded in an easy-to-use book. This book features material from an all-star cast of writers, including Christopher Breen, Dan Frakes, Jonathan Seff, Kirk McElhearn, and Jim Heid. Together, they lead you through every aspect of building, managing, and protecting your digital music library. Whether you're a complete beginner or a seasoned pro, this book provides practical advice and advanced techniques that you can put into use right now. You'll learn how to import music from CDs, cassette tapes, and LPs without compromising on sound quality. As your music library starts to grow, you'll find smart strategies for organizing and managing your music files so you can find exactly what you want--or discover some unexpected pairings. But iTunes isn't just about music anymore. We've also got the inside scoop on downloading podcasts, video blogs, and TV shows, or if you prefer, converting video from your own DVD collection for playback on your video iPod. Speaking of iPods, we've got plenty of tips and tricks for taking advantage of their lesser known powers (need an alarm clock while on the road? ), as well as squeezing out extra battery life. We'll also show you how to protect your music library from potential disaster, and how to troubleshoot potential problems before they turn into disasters. Best of all, every chapter is filled with smart ideas and time-saving strategies so you can spend less time managing your music more time enjoying it. Printed Book ($24.99): Order a lavish, full-size, full-color printed book on high-quality paper for just $21.99 including shipping and handling! (That's $3 off the regular price!) PLEASE NOTE: On the check-out page, enter the coupon code MWREADER2 for your $3 Special Reader Offer to be applied. PDF on CD-ROM ($15): Don't want to download the PDF? Get it on CD-ROM for only $12 including shipping and handling. (That's $3 off the regular price!) PLEASE NOTE: On the check-out page, enter the coupon code MWREADER2 for your $3 Special Reader Offer to be applied.